Are you currently searching for a new office copier and not sure where to find the best one for your business needs? Whether your a small business or global enterprise, it’s probably harder than you might have imagined because of how many different products and manufacturers come up in your search results online. Let’s face it, you probably don’t want to take the time out of your busy workday to read reviews and compare different office copiers you come across. Even though this process might feel time-consuming, it’s imperative to do your research if you truly are interested in getting the best copier for your business. You probably have certain expectations when looking for the best copier such as getting the best copier cost and value by trusting the company or service provider you’re paying. Forbes published a great article on Three Ways to Build Customer Trust, which we fully agree with and stand behind when it comes to purchasing new office equipment and learning how to find the best companies. To save you time sifting through websites and reviews, we put together some quick tips you can use to help guide you in selecting the best office printer or office copy machines for your business needs, such as printing volume (color printing or black and white) or print speed (in pages per minute or ppm). Have you downloaded our pre-purchase checklist yet? This checklist helps you purchase, lease, and install the right copier in days. Purchasing a new copier (or multi function printer) doesn’t just mean the machine purchase itself, but also the company you’re using or partnering with. Before you start comparing different office copiers, you first need to find a service company or provider you can trust, who has excellent customer service, and one who provides you with the specific services your business needs. Learn more about your business needs and how you can directly apply these to your office equipment by reading our article, How to Choose the Best Office Copier For Your Business. One of the most important aspects to consider when searching for a new commercial copier or printer repair company is making sure the service provider provides you with a service technician or team who are trained troubleshooters, especially in instances that your machine is facing a complex issue. A great service professional can assist you in purchasing the best office copier for your business, based on your needs, the line of work, and your business goals. The service provider you choose should be willing and able to reseat any software on your copier as well as having the skills to reprogram error messages that continue to pop up. Great service teams may also assist your copier issues remotely or over the phone, saving you time and eliminating an on-site appointment. How long does it typically take for your current service technician to contact you once you’ve placed a service call? A great service technician should contact you within 30 minutes of your service request, following an on-site visit within two hours or less, no matter what. Their job is to serve you and the needs of your office copiers. Time is money and your provider’s service techs need to respect your time so you can get up and running in the least amount of time—and back to making money. Dealing with a broken or malfunctioning copy machine can delay an office’s work productivity, so it’s essential the service technician provide you with instant communication. Reading customer reviews is probably the easiest and best way to learn how quickly a company’s response time is. Alternatively, ask for their average response time. Each dealer should be monitoring this on a continual basis. Just like people, copiers need upkeep, too. Depending on the terms of your contract, your service provider should regularly visit and check on the maintenance of your machines, to make sure everything is running smoothly. Your service technician may also leave extra supplies for your machine when they visit, such as toner, so you don’t have to wait to order it when you run out. Make sure to check your contract terms to see what maintenance upkeep services your company has access to. It should be very easy for you or your office manager to manage, track, maintain and update the inventory and parts of your office copier. The most effective way to do so is through an online portal, where you can easily place service calls, supply orders, and enter your device’s meter readers. Meter reading is very important to your service provider so that they can react to your needs (machines, supplies, and service) as your business is growing. Having an online portal allows you to have everything you need in one place where you can access it at any time of day. Access is everything. Can you text, call or email them with orders or service requests? If they don’t then they aren’t thinking about what is easiest for you. During the frantic moments when your office copier breaks down, your primary goal is to get the machine back up and running as soon as possible. To do so, your service technician must have the experience and skill to fix a multitude of problems at that a specific time. It’s a huge waste of time to have a service technician come out to find later out he then has to call someone for back up. You also want to make sure that technician can fix multiple problems in one visit, instead of having to come back on a later day. Find out how much inventory they carry on their vehicle to resolve issues. A highly-rated service provider invests in parts and supplies to ensure they can get you up and running the first time, every time. There really isn’t anything pleasant about a broken copier. In fact, it’s usually the opposite feeling. With that being said, there’s nothing better than your service technician showing up, on time, with a smile on their face, and ready to help. Having a happy service technician shows their dedication to helping you, along with showing that they really do love the company they are representing. Company loyalty is important and makes you feel even more assured that you have trusted the right individuals to provide their services to you and your company. Nowadays, we tend to skim, or even skip over, parts of a contract that we are really supposed to be closely reading and understanding. This can potentially leave you or your company stuck with a provider that really isn’t the best fit or you or a maybe that service provider doesn’t meet your expectations. It is crucial to read over each and every part of the contract, or Service Level Agreement (SLA). You need to have a full understanding of the services you are paying for as well as the services you are requesting to be met. Any questions or concerns you may have up front about the SLA should be asked and reconciled before the agreement is signed, to ensure your needs will be properly met. This allows you and the service provider to have an open understanding of what the services entail, eliminating the fear of being left in the dark. Purchasing big office equipment for your business is an important decision you’ll have to make to ensure the success and growth of your company. It might take a little time to find the best copier and service provider for your business, but the investment in research is worth it in the long run. Now that you’ve read about finding the best copier for your business, read our article, Top 10 Color Copiers For SMBs: Cost, Quality, Features Explained. Visit our Office Copy Machine Ultimate Resource Page for additional info on features and benefits, and just about anything else related to your office copiers. 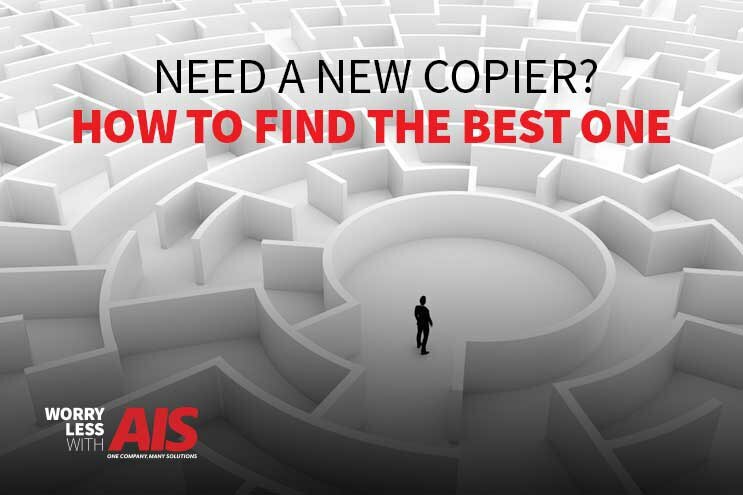 AIS is your resource when it comes to copiers, printers, managed IT services, document and process management, copier and printer repair and maintenance contracts, and telephone services. We’re also here to educate and inform you on the best and newest ways to support your business needs through business technology and solutions. If you’d like to learn more about our services, reach out to one of our business technology consultants, here. We’re here to give you peace of mind to help you win more business.